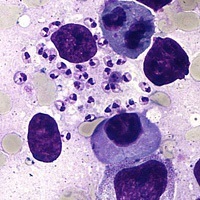 The NNN (Novy-MCNeal-Nicolle), medium is a common and world known medium for isolation of the agent of the genus Leishmania, that causes Leishmaniasis (cutaneous, mucocutaneous or visceral) . Culture of this organism in a suitable media give rise to motile, extracellular form called, promastigote. A variety of media have been used for the culture of Leishmanias. These can be divided into three main categories: semisolid, biphasic, and liquid. Other in vitro culture media includes RPMI 1640, Evans and Schneider. NNN Medium was developed by Novy, McNeal and modified by Nicolle . NNN medium consists of two phases, blood agar base (part A) and Lockes solution (part B). This medium consists of a blood agar and an overlay medium. The blood agar base is a highly nutritious medium that supports the growth of fastidious organisms like Leishmania and Trypanosoma . The specimens are inoculated into the liquid phase of the biphasic medium and incubated. The amastigotes transform to promastigotes in about 24 hours. If you are in USA, CDC can provide ready to use NNN culture medium. You can inoculate the sample (keep it at room temperature) and mail them as soon as possible by overnight mail. CDC incubates the sample for 4 weeks, and if the culture becomes positive, it performs isoenzyme studies to identify the species of the parasites. Disease diagnosis: Culture is not a common practice in the diagnostic laboratories as they perform Giemsa stain to detect the amastigote form of Leishmania or uses the serological tests like rK39, DAT to make diagnosis (in visceral leishmaniasis). But in equivocal/indeterminate cases; culture can confirm the diagnosis. Making of Culture Media/Tube: Commercial suppliers mostly supply dehydrated media (in the form of free flowing powder). You can prepare ready to use culture media following the procedure mentioned below. Suspend 31 grams in 1000 ml distilled water. Heat to boiling to dissolve the medium completely. Sterilize by autoclaving at 15 lbs pressure (121°C) for 15 minutes. Cool to 45°C and aseptically add sterile defibrinated rabbit or human blood. Mix well and dispense in 5 ml amounts in test tubes or 25 ml amounts in flasks. Allow tubed media to cool in slanted position. Suspend 11.2 grams of Part B in 1000 ml distilled water. Cool and add approximately 2 ml in tubes or 10-15 ml in flasks over solidified Part A medium. Keep the prepared media refrigerated until it is used (stable for 2-4 weeks) and bring it to room temperature right before inoculation. Inoculate the specimen (spleen aspiration or bone marrow biopsy or lymph node aspiration) into the liquid phase of the biphasic medium. Incubate at 21-26°C for 4 weeks. Check for the growth of the organism and for possible fungal contamination after 4 days and continue by 4 days intervals for next 4 weeks. If positive, luxuriant growth of the organism is seen in the media. 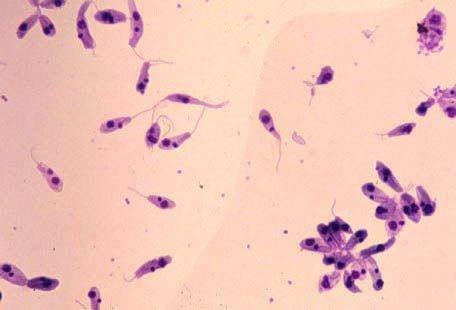 Giemsa stain the culture filtrate and observe under microscope; free, flagellated, Leishmania promastigote. Thank you Sir. The post is really useful. Thank you Ahmed for inspiring comment and suggestion.